Need your daily fix of free apps? We’ve handpicked 47 iPhone, iPad and iPod touch apps that are free today only. 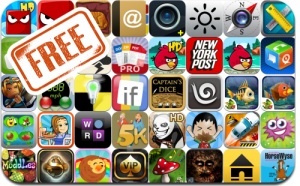 This apps gone free alert includes Angry Birds Seasons, Diner Dash: Grilling Green Deluxe, ArcherWorldCup, Magical Forest, Gosar. Ep. One, TinyLegends, Texas Poker VIP, WordBreaker, Steamscope, and many others. WordBreaker HD – The Lingo Trainer!